I hope you are doing well with your new goals and haven’t fallen off the band wagon yet. If you are trying to eat a healthier diet or just eat more vegetables this year, there are plenty of resources out there. Of course there are lots of gluten free blogs out there. And lots of vegetarian blogs too. But there are a ton of other resources, most of which aren’t specifically gluten free or vegetarian but still provide me with lots of inspiration. One of the recipes below is from Cooking Light magazine, one from Vegetarian Times magazine, another from Sunset magazine and the other from Food and Wine magazine. I also make recipes from a lot of blogs. Most of which are not specifically gluten free. Some of my recent favorites are The Taste Space, Dana Treat, Fat Free Vegan Kitchen and Kalyn’s Kitchen. Recipes abound out on the interwebs, so don’t be afraid to look around, especially at all of the non-gluten free blogs. 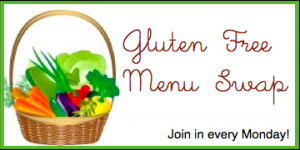 It’s so easy to modify most recipes to be gluten free. So if you need some inspiration, be sure to check out some of my favorite blogs over on the right as I have just updated my links. Capitalizing on last week’s “Eat More Produce” theme for the Gluten Free Menu Swap, Heather at Celiac Family chose broccoli as this week’s theme. We love broccoli here at our house. We love it steamed, stir-fried, roasted – it doesn’t matter – we eat it and love it. This week we’ll be having it roasted alongside some dal. And I’ll probably be eating it lightly steamed for lunch at work this week too. It’s so easy to just put some in a glass storage bowl and take to work. Take the lid off, drizzle in a little water before popping it into the microwave for a minute or two, and then I like to sprinkle it with a bit of salt. I don’t need any butter or other sauce. Mmmm…broccoli. What is your favorite way to eat your broccoli? Buttery Pigeon Pea Dal with Roasted Broccoli and Brown Rice – we didn’t get to this last week. What are your favorite sources of inspiration? Your new favorite blog, magazine? Let me know – I can always use more! Hi Renee. Menu looks delicious as always. I get most of my inspiration from other bloggers. Last week it was Hallie at Daily Bites who influenced lunch and dinner. This week it was Lexie’s Kitchen with Kale Salad Wraps. I make my menus every week, but do get distracted when someone posts a new recipe. Hi Wendy – I am checking out Lexie’s kale wraps this week too. Did you like them? Luckily I try to only go to the grocery once a week, so even if I do get distracted by what others are up to, I usually don’t have the time to go buy more ingredients. But those distractions get written down in my notebook here next to the computer for future inspiration! Thanks for stopping by! Thanks for joining the menu swap this week. I knew I could count on your for adding some ideas for eating broccoli, and getting lots of produce in your diet. :) Looks like another healthy week at your house! Hey Heather! Thanks for hosting! Oh my these all sound delish! Do you have a favorite from this list? Jackie – Right now the winner is the Italian Chickpea Soup from this past week. But the dal may try to push it out of first place tomorrow as I think the leftover dal will be better than it was the first time around, and it was good the first time.